The National Endowment for the Humanities (NEH), an independent federal agency created in 1965 and one of the largest funders of humanities programs in the United States, is celebrating its fiftieth anniversary in 2015–16. To mark this historic event, we would like you to tell us about an NEH grant or grant product that has made a difference in your life, career, community, or academic field. To contribute stories about NEH’s past or for more information, send an email to NEH50@neh.gov. Please include your name and telephone number in your message. CAA’s nine Professional Interests, Practices, and Standards Committees welcome their newly appointed members, who will serve three-year terms (2015–18). In addition, three new chairs will take over committee leadership. New committee members and chairs will begin their terms at the 2015 Annual Conference in New York. CAA warmly thanks all outgoing committee members for their years of service to the organization. Committee on Diversity Practices: Ann Albritton, Ringling College of Art and Design; Mariola Alvarez, Washington College; Raél Jero Salley, University of Cape Town; and Edith Wolfe, Tulane University. The new chair is Christine Young-Kyung Hahn of Kalamazoo College. Committee on Intellectual Property: Amy Ogata, University of Southern California. 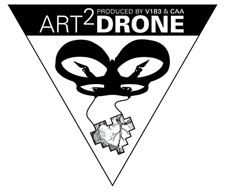 Committee on Women in the Arts: Jenn Dierdorf, A.I.R. Gallery; Johanna Gosse, independent scholar, Seattle; Heather Belnap Jensen, Brigham Young University; Caitlin Margaret Kelly, Duke University; Miriam Schaer, Columbia College Chicago; and Jean Shin, Pratt Institute. Donna Moran of Pratt Institute is the new committee chair. Education Committee: Kathleen Holko, Bruce Museum; Richard D. Lubben, South Texas College; and Christopher Ulivo, Santa Barbara City College. International Committee: Alexandra Chang, Asian/Pacific/American Institute, New York University; and Fernando Luis Martínez Nespral, University of Buenos Aires. Museum Committee: Jill Deupi, Lowe Art Museum; and Ivan Gaskell, Bard Graduate Center. Professional Practices Committee: Susan Altman, Middlesex County College; Eunice Howe, University of Southern California; Walter Meyer, Santa Monica College; and Greg Shelnutt, Clemson University. Bruce Mackh of the University of Michigan has become the committee’s new chair. Services to Artists Committee: Jan Christian Bernabe, Center for Art and Thought; and Carissa Carman, Indiana University. Student and Emerging Professionals Committee: Tania Batley, Lefferts Historic House; Rachel Kreiter, Emory University; and Jenny Tang, Yale University. Can the First Amendment Survive the Internet? Ask the Art Professor: How Can I Study to Become a Professional Artist on My Own? 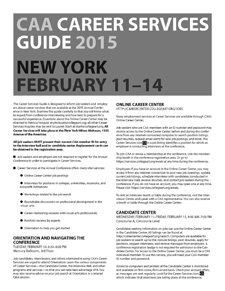 CAA has designed the Career Services Guide to inform job seekers and employers about placement activities at the 2015 Annual Conference in New York. The publication, available as a PDF, will help you navigate Career Services events and provides answers to frequently asked questions. Study this guide carefully so that you will know what to expect from conference interviewing and how best to prepare for a successful experience. Printed copies of the Career Services Guide will be distributed onsite at Orientation and in the Candidate Center. All conference Career Services will take place at the New York Hilton Midtown. For more information about job searching, professional-development workshops, and more, visit the Career Services section of the conference website. What Can Learned Societies Do about Adjuncts? Will There Be Life after Death for New Private Museums? Ballroom Marfa is presenting two recent videos by Nicole Miller, as a highlighted artist participating at the Artists’ Film International. This project means a collection of artists’ film, video and animation from around the world that has been coorganized with Whitechapel Gallery in London. Miller (b. 1982; Tucson, Arizona) lives and works in Los Angeles. Her films and installations explore the transformative capabilities of the moving image to reconstruct interpretations of self and culture. Through storytelling, self-representation and self-presentation become a narrative in search for the reconstitution of physical and psychic manifestations of loss. Her videos often focus on the interplay between preconception and reality in terms of African American identity, as in the case of The Conductor (2009), presented earlier this year at the High Line Art Program. In this occasion, Ballroom Marfa is presenting two recent projects by Miller. In David (2012) we can observe the fragmented image of the profile of a man that the artist encountered by chance on the street. Here, he narrates the events that lead to the amputation of his left arm whilst his right limb is reflected in a mirror—a rehabilitation technique that helps patients deal with the painful symptoms of a phantom limb. Death of a School (2014) is a predominantly silent four-channel video that meditates on the events of a soon to be shutdown school in Tucson, which is Miller’s hometown. Presented together, Miller’s films become powerful narratives that carry the possibility of reconstitution of lost histories and identities. Casas Riegner presents Indicios (Signs), an exhibition that gathers Johanna Calle’s most representative works produced between 1990 and 2014. Seeking to examine closely the visual language that has characterized her work for more than two decades, the exhibition includes a selection of projects in which different processes developed by the artist are juxtaposed. In each series of work, Calle exposes her approach to the creative process, where she also unveils a sense of unsettledness and curiosity. Featuring her conceptual research and creative use of unconventional materials, the display includes Calle’s assemblages, signs, and phonetic representations of indigenous languages, photographic drawings made on vintage analogue photographs, and the intervention of archives and documents that are part of different research projects. For the documentation-based installation Hermanas Figueiredo (2013–14), Calle reconstructed a story as a gesture of redemption to the Brazilian sisters that devoted their life to a scientific research around the life of butterflies in the first half of the twentieth century. However, they have lost the legal battle with a recognized Brazilian professor who was hired to catalogue their collection and had deliberately chosen to wrongly assign its authorship and ownership. The case was dismissed and labeled as exhaustive and rigorous maniac women’s work. Calle holds a BFA from Universidad de Los Andes en Bogotá and an MFA from Chelsea College of Arts in London, England. Her projects Perímetros I and Perímetros II were included at the thirty-first Bienal de São Paulo, Brazil in 2014. Pavel Zoubok Gallery presents Love Songs, a solo exhibition of new work by Donna Sharrett, including two of her largest—yet humanly scaled—works to date, framed by Sampling, a related group show curated by Dara Meyers-Kingsley. Sharrett (b. Philadelphia, 1958) is the recipient of two fellowships from the New York Foundation for the Arts as well as notable residencies and grants from Smack Mellon, the Bronx Museum and the Millay Colony for the Arts Residency. Her work has been widely exhibited, including a solo exhibition at the Everson Museum in Syracuse, New York, and group exhibitions at the Museum of Arts and Design in New York; the Bellevue Arts Museum in Bellevue, Washington; the University of Rochester in Rochester, New York; and Marianne Boesky Gallery in New York. Her work is represented in the collections of the Museum of Contemporary Arts and Design in New York; the United States Embassy in Valletta, Malta; the Hebrew Home for the Aged in New York; and J. P. Morgan Chase in New York. A full-color catalogue will accompany the exhibition. Cameron: Songs for the Witch Woman is the first survey of Cameron’s work since 1989 and explores the artist’s role as a seminal figure within Los Angeles’s midcentury counterculture, her unique melding of surrealism and mysticism, and her unwavering commitment to live her life as art. “Navigating between disciplines and traditions of poetry, cinema, visual arts, and spirituality; Cameron has opened many doors that continue to intrigue and inspire generations of artists,” while “her hallucinated vision … embodies an aspect of modernity that deeply doubts and defies cartesian logic at a moment in history when these values have shown their own limitations,” as stated by MOCA’s director, Philippe Vergne. Born in Belle Plaine, Iowa, Cameron (Marjorie Cameron Parsons Kimmel) (1922–1995) emerged as an artist, performer, poet, and occult practitioner in Los Angeles, uniquely bridging the city’s flourishing spiritual and art worlds at midcentury. She arrived in Los Angeles by way of the Second World War, where she drew maps and labored in a photographic unit for the United States Navy. A visionary painter and unparalleled draftsman best known today for her paintings and drawings of human and fantastical figures, she spend her last days in West Hollywood largely unrecognized. Cameron’s frenetic, delicate renderings of mythological figures reveal a singular attention to line and the idea of spiritual metamorphosis, evoking the surrealism and symbolism of the French poets. She is closely associated with Beat artists such as Wallace Berman, George Herms, and Dennis Hopper, the filmmakers Kenneth Anger and Curtis Harrington, and the occultist Aleister Crowley, while she was mentor to younger artists and poets such as David Meltzer and Aya (Tarlow). Cameron’s artwork appeared in the first issue of Berman’s celebrated journal Semina (1955–64) and has also been included in group exhibitions at the Whitney Museum of American Art in New York, the J. Paul Getty Museum in Los Angeles, the Martin-Gropius Bau in Berlin, the Pasadena Museum of California Art, the Centre Pompidou in Paris, and the Los Angeles Municipal Art Gallery in 1989. Comprised of nearly one hundred artworks and ephemeral artifacts, the exhibition includes pieces formerly thought to be lost, ranging from early paintings to drawings, sketchbooks, and poetry from her late years, as well as ephemera and correspondence with individuals such as her husband Jack Parsons (1914–1952), a rocket pioneer and a founder of the Jet Propulsion Laboratory, and the renowned mythologist Joseph Campbell. The exhibition brings to life the recently published book titled Songs for the Witch Woman that features a series of poems written by Parsons alongside illustrations drawn by Cameron that echo the intimate themes of their turbulent love story. In conjunction with the exhibition, the Cameron Parsons Foundation is producing an eighty-eight-page catalogue with approximately seventy-five full-color illustrations. Since the early 1990s, the French artist Sylvie Blocher has built up a body of video work that takes the human as its material, in all its fragility, unpredictability, and yet full presence. She engages with a poetics of relation, emancipation, the questioning of identities, the writing of history, the permeability of the masculine/feminine border, and codes of representation in a world under control. Created in different geographic regions, her works are based on exchange: they often involve the participation of lay people, who are invited to present themselves in a completely new fashion before the camera, as the artist “shares her authority with her models” to create what she calls Living Pictures. A survey of the artist’s work is also presented in two of the museum’s galleries, where video installations and drawings sample key themes of Blocher’s work: the sharing of responsibility, the question of politics, identity, dreams, and utopia. By using music to give new life to important speeches and manifestos made in contemporary history (by Angela Davis, Édouard Glissant, and Barack Obama, among others), the five videos that form the series Speeches (2009–12), which are part of the Mudam Collection, engage with the political dimension of the imagination, individual and collective. Other works, such as the diptych Change the Scenario (Conversation with Bruce Nauman) (2013) and the three videos recently created by Blocher in Texas, tackle historic and racial aspects in the construction of the individual. Placed at the entrance to each gallery, a series of drawings that the artist has made every day for a year, based on the front page of the newspaper Libération, emphasizes the passages between the personal and the political initiated by her practice.